Many of us would shrug off when the word "cancer" or the "dreaded C" is brought into the conversation. Perhaps many still fear it and many just don't know how to deal with it. Cancer, for a fact have inflicted many families in painful means unimaginable, where money and emotions are highly tied into the issue. But for those who have won the battle against it, it stood as a beacon of light, where hope isn't invented but a power. I can only record one cancer fighter in our family, my uncle who has had a colorectal surgery twice in Milan, Italy. He's back here in the country and have survived cancer. In my lifetime, there were a few instances when I had encounters with patients who have cancer. The most heart-breaking one was when I last visited the pediatric cancer ward in PGH for our church' outreach ministry. Some of the kids were in stage 4 already, and when we talked to the parents, most of them said "kung nalaman lang namin kaagad at na-ipacheck, baka di sana umabot sa ganito." ("if only we have known earlier and have our kid checked, it may not come to this). Like many other cancers, the majority of deaths occur in low- and middle-income countries, where most women with breast cancer are diagnosed in late stages due mainly to lack of awareness on early detection and barriers to health services. This is were cancer risk assessment comes in. 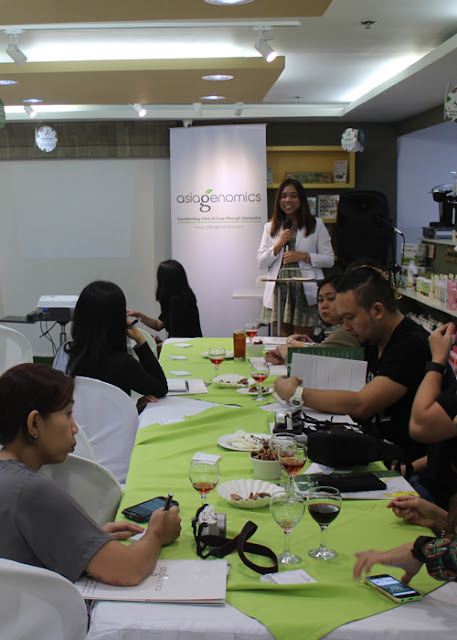 And that in mind, I attended a talk at Apotheca in Chino Roces. My knowledge about cancer is just so general, even though I've worked with some oncologists and chefs when we were organizing this group called Eat and Cheat Cancer. Sure we can build our body up and our immune system to ward off many illnesses, which may include some kinds of cancer, but what if we have cancer in our genes, in our family, and we didn't know our great-grandparents could have succumbed to it without them or us even knowing. Yes, cancer can be inherited. Just one of the facts I've learned in the talk. According to the speaker, Dr. Mars Imasa, Some types of cancer run in certain families, some faulty genes that increase the risk of cancer can be passed on from parent to child. However, most cancers are not clearly linked to the genes we inherit from our parents. Gene changes that start in a single cell over the course of a person's life cause most cancers. How can we find out then? To know whether cancer cells may run in the family, we need to undergo what the doctors call Genetic Testing. Genetic testing is basically a study of your DNA. It explores what you inherently have in your system as possibly inherited from your parents and grandparents. It searches for possible mutations and changes in your genes that may affect your health in the following ways: susceptibility to certain conditions, possibility of passing on these conditions to your children. Dr. Mars also zeroed in on BRCA1 and BRCA2. These are human genes that produce tumor suppressor proteins. These proteins help repair damaged DNA and, therefore, play a role in ensuring the stability of the cell’s genetic material. When either of these genes is mutated, or altered, such that its protein product either is not made or does not function correctly, DNA damage may not be repaired properly. This then can result to develop cancer. So, where then can we go for this? 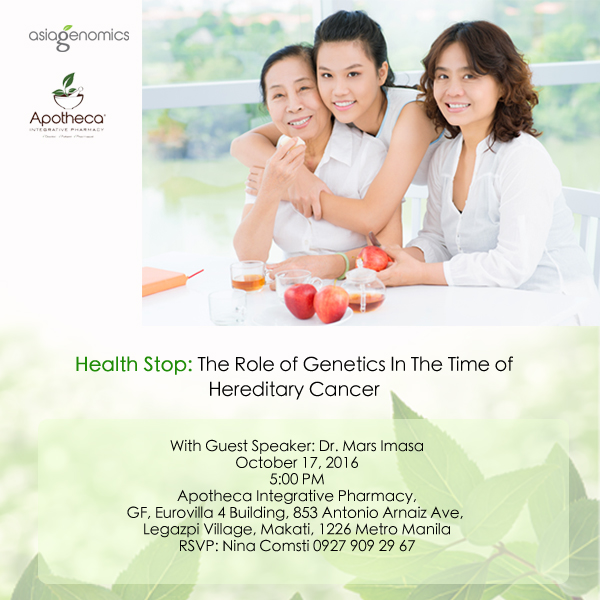 There are a small number of health systems that do do genetic testings, one is Asia Genomics. 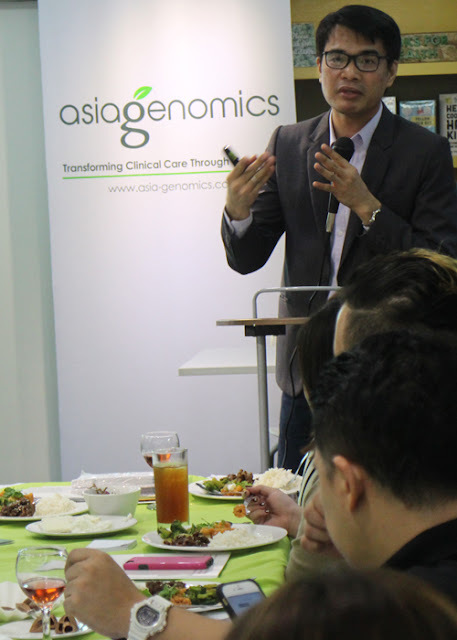 Asia Genomics is a molecular diagnostics company driven from Singapore and now accessible in the Philippines. This rapidly growing molecular diagnostics company specializes in clinical genomics & genetic testing. Formed by a professional team with diverse experiences, Asia Genomics is passionate about making genetic testing accessible to healthcare professionals and patients in Asia. Testing may depend on the kind of cancer you have, samples for instance blood, saliva or tissue can be collected. These are are then sent to an accredited laboratory for DNA sequencing. For BRCA1 and BRCA2, saliva test is enough. What are the other benefits and are there limitations on genetic testing? 1. Aside from discover possible conditions you may have in your system. These may lead to early intervention of treatments that can help you determine healthcare costs, save time and implement preventive measures. 2. It can also help you and your family members understand the journey of how they can prevent or reduce the chance of genetic condition in their lifetime. 3. However, it is important to know about the limitations of genetic testing as every test does not determine the underlining cause of a genetic condition. A conversation between you and your healthcare provider is crucial for evaluating and recommending the most suitable solution on what genetic testing can offer. 4. Before you can undergo any genetic tests, you need to undergo first Genetic Counseling, which according to the speaker may take some time as only a number of doctors do this, he actually know only one colleague whom he refers his patients to. Asia Genomics, however have this certain type of service as well. It depends on your status, it used to be very expensive, and many have resorted having it done abroad, but now Asia Genomics is offering it for only P 28,000. With that amount, you are assured of a hopeful future, whether getting ready for the Big C or having that peace of mind that everything is okay. How and where can we contact Asia Genomics?